On Wednesday last week, I learned that my dear friend would be going into the hospital today to deliver her baby (early) due to some complications. I am worried for her and her baby, but have faith that everything will be all right. She has a wonderful doctor and is in good hands, I’m sure. In the mean time, what do knitters do when they are worried? They knit. On Friday, I hit the LYS, with the intention of procuring some yarn for one of these. I chose Mission Falls 1824 Wool and brought it home, casting on immediately. 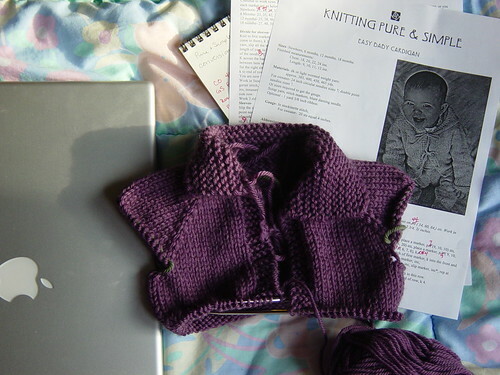 I’d had hopes of finishing it up by today, and was ready to knit furiously on it all weekend. 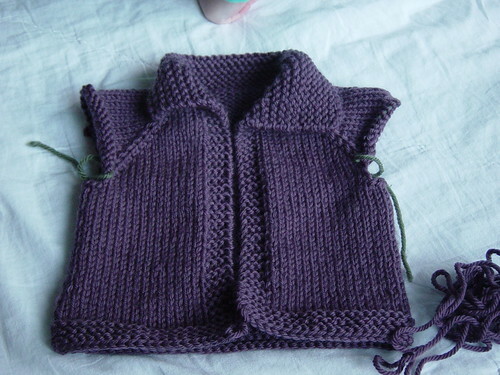 The only problem is that I didn’t get the gauge of 7 sts/in that would give me a newborn size. No. And d’ya think I could have been troubled to go down a couple of needle sizes to get the correct gauge according to the pattern? No. 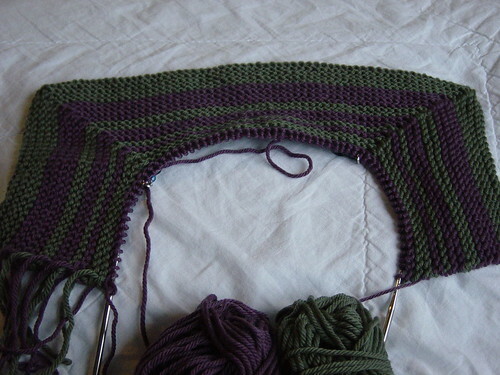 I decided to adjust the pattern for my gauge (oh, the hubris!) and attempted to work the pattern with 75% fewer stitches. 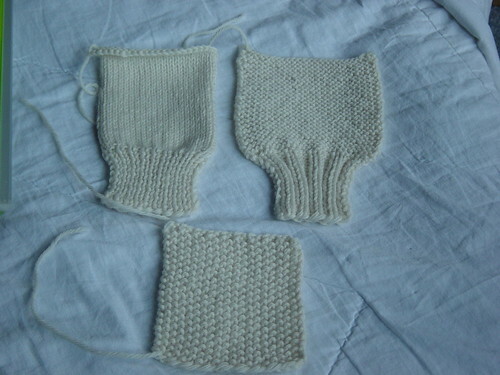 I knit and knit and knit, planning the stripes carefully and working the decreases, going back and forth and back and forth late into the night. That was Friday. I woke up Saturday morning and had a good look at my progress. One side was about five stitches shorter than the other. I tried to make it work, counting back and making sure I was decreasing in the right places, but I just couldn’t figure it out. Given my yen to have a baby sweater for my friend by today, I abandoned my attempt at the BSJ in favor of this quick little knit. And then I ran out of yarn. Speaking of my trip to the LYS on Friday, I ran into another knit blogger who recognized me from either my blog or ravelry. She introduced herself by the name of her blog (also her Ravelry handle) which is really funny to me. I was so enthused to meet another knit blogger that I thought afterward I might have come off rather too strongly. I guess I was wrong. She describes our meeting and said some really sweet things about me on her blog (hi, Jen!). We hope to get together for some knitting soon. Yay! Three swatches that need to be washed, tagged, and bagged. I’m going to shoot for three swatches a week and get these puppies done!